The Steamboat Channel Reserve is a 35 acre northern section of Pointe au Baril’s Mackenzie Island, which borders the southern shore of Old Steamboat Channel. The property is both highly ecologically significant and historically treasured by the Pointe au Baril community. 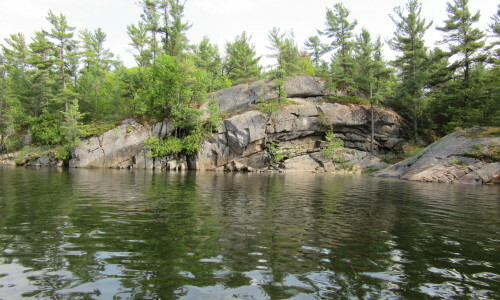 Old Steamboat Channel is so named because its depth, orientation, and sheltered waters made it a favoured passage for the steamboats that served Pointe au Baril before the railways and roads were built. Many of Pointe au Baril’s earliest cottages were built in the surrounding area, but the channel itself remained largely undeveloped. Long valued by the community for its natural and unspoiled shoreline, it has become a favourite destination for canoeists and kayakers now that the steamboat era has passed. Protection by the Georgian Bay Land Trust ensures that this channel will remain in its natural state, to be enjoyed by people and animals alike. Thank you to the many generous donors from the Pointe au Baril community who made the protection of this property possible.